Some of you might wonder how I got interested in ventriloquism. Well, it went something like this: I did magic tricks, and saw that they always advertised how you can learn to do ventriloquism. So I sent away for instructions on how to do ventriloquism. When the material came I was very disappointed. They had included some sort of whistle, I do not know to this day what that was for, also the information they gave me was very skimpy, like they really did not want me to know how to do ventriloquism. So being an avid student, I consulted an encyclopedia. I found that it was very helpful, but I still wanted to learn more. I was in a High School boarding school at Prairie Bible Institute in Three Hills, Alberta, Canada. Then God sent along a Bible School student to come and help me, I think his name was Jim Wert. He had used ventriloquism in a Chapel service. He was very professional and did an excellent job. I just had to talk to the man, so after our chapel service was over I went up to him and asked him if he could teach me how to do ventriloquism. He was very helpful and taught me everything he knew. He even gave me his ventriloquist dummy and some routines. One routine he gave me was called The Joke Was on Her! I have changed this routine some through the years, but it is very similar in the first part to what Jim Wert gave me. I did add the last part about David and Goliath and salvation. 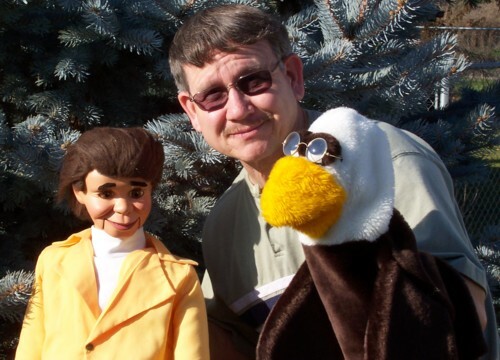 I am very thankful to God how He allowed me to learn ventriloquism to use for Him through the years. I do not know how many times I have used my ventriloquism in public, but it would probably run into the hundreds. I was once invited to speak on radio, and another time I was on a local TV station. Of course since then, we have been on the internet for several years. I love entertaining people, and getting a message across from the Bible as well. All of us love to pretend and we are really just kids at heart. That’s why ventriloquism is so well received. I trust that you will learn how to do ventriloquism and use it for God’s glory, and the salvation of many souls.